Parsons: Liking Qatar's "Good Shape, Parsons gives it a "B+", 75/100. Michael5000: There's no other flag quite like Qatar's -- except, um, Bahrain's, and since they live next door it can be hard to keep the two straight in your head. Qatar's is maroon as opposed to Bahrain's red, and has more serrations in the serrated line between the color and the white. Apparently, the symbolism of the two serrations is completely different, but I am not buying any theory of independent evolution. Incidently, Qatar not only has a too-long bad shape, but with a prescribed ratio of 11:28 a faintly ridiculous one. [Romania] had used a blank tricolor in the past, but during the communist era... there was an appropriate communist national symbol in the yellow stripe. After the cretinous Ceauşescu dictatorship was toppled in the late '80s, [the communist] symbols began to be torn off or cut out of Romania's flags, sometimes leaving a defiant hole in the yellow stripe. 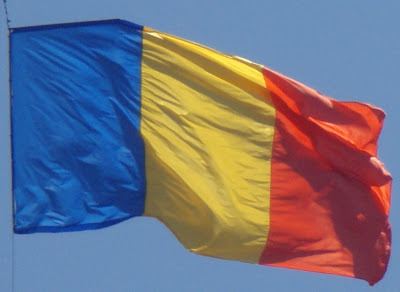 In 1989, the blank tricolor was made official -- but this rendered Romania's flag identical to what was now an existing national flag, Chad's. Chad complained about this to the U.N. in 1994, but Romania understandably didn't feel like changing at that point. I can't imagine that anyone in the international diplomatic community felt too excited about taking the question on; in any event, the issue seems to have faded. If Romania and Chad ever go to war using 18th Century infantry tactics, though, there's going to be real trouble. Parsons: Without comment, it gets a "B-", 65/100. Michael5000: Among the benefits of the dissolution of the Soviet Empire has been a profusion of new flags, most of which are pretty cool. I'm going to include the "new" Russian tricolor on this list. 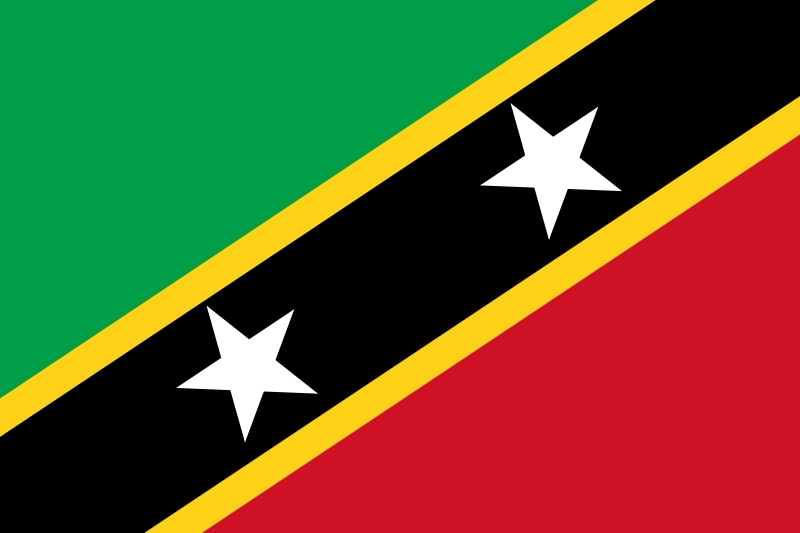 I used quotes there, though, because this new flag actually dates back to the seventeenth century. There are various stories about how it was one way or another reconstructed from the Dutch flag, which is one of those plausible ideas about which we will never know if it is true or not. Anyway, I wouldn't have thought that anything "new" could have been done with red, white, and blue. But the surprising placement of the white stripe kind of remakes the color scheme. It's "fresh." Parsons: Disliking "Plagiarism," "Writing," and that it's a "Bad Tricolour," he gives it a "D", 40/100. 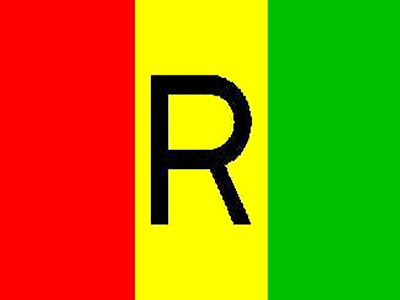 "Writing a big R on an overused tricolour spectacularly unoriginal." 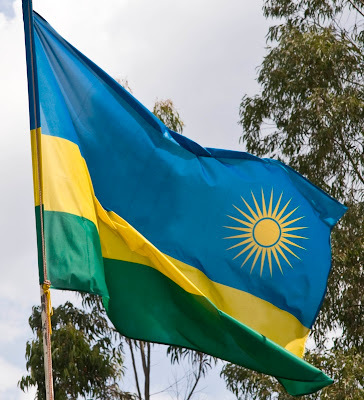 In abandoning this design, Rwanda earned the Most Improved Flag prize in the L&TM5K Awards for Flag Merit back in 2008, beating out Georgia, Democratic Republic of the Congo, Eritrea, and Lesotho. "A profound improvement," commented a slightly younger Michael5000. Parsons: Without comment, it gets a "B+", 76/100. Michael5000: Given my famous enthusiasm for white stripelets, though, you might assume that this flag would work for me. But to tell you the truth, yellow stripelets leave me a little cold, especially sitting next to white stars. I think either all white or all gold would have been a better idea. Interesting geometry, though, of the angle of the diagonal being parallel with one of the lines of a perfectly upside-down star. See what I mean? This feels like a rerun. I guess I'm remembering it from when you blogged on all these flags' lookalikes. Perhaps your interest is flagging. 11:28 or not... I love Qatar's flag! 2. Romania Romania Romania. sigh. Chad, Moldova, Andorra. Remember my rule about seals - the latter two don't get a walk by sticking some thingy on their neighbor's flag. Blame it on the French. Romania had this nice horizontal primary tricolor going, currently unused on the National level. Then they changed it vertically, possibly to mimic the French. And of course Andorra was influenced by France, being almost part of it. 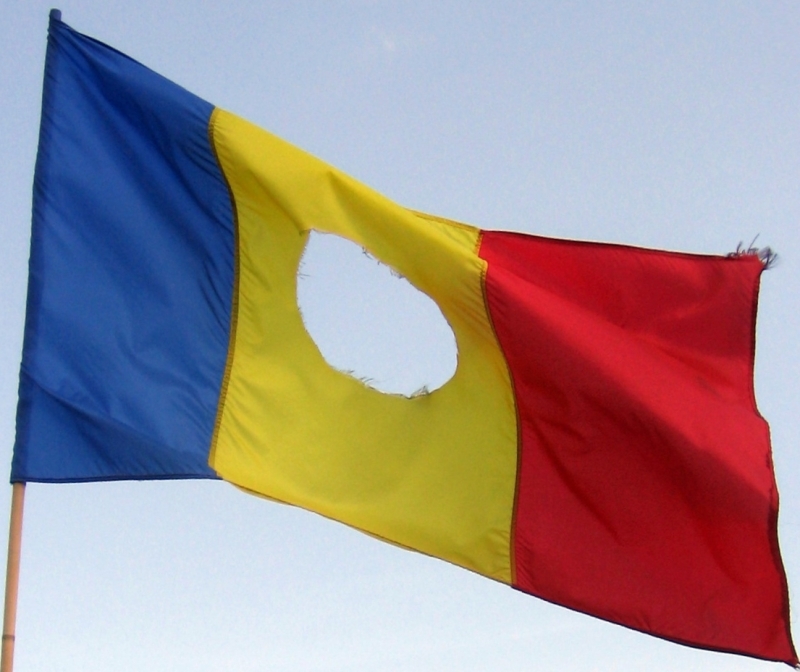 Moldova, of course, pretty much shares Romanian history on the flag front. And Chad, well, the former French colony didn't really go out on a limb after their independence, did they? In the International Flag Court of VoronX, I give Romania the vertical symmetric tricolor, and I require that Moldova go back to the Horizontal tricolor they had originally, like a good little former SSR (they can keep 2:1 if they choose). And Andorra, come on, 8:9:8? You're not fooling anybody. Really, if you're going to make the middle stripe wider to honor Spain, then do it in a 1:2:1 proportion. You are hereby ordered. And finally Chad, what were you thinking? that little seal doesn't mean you can co-opt the Romanian "civil" flag! 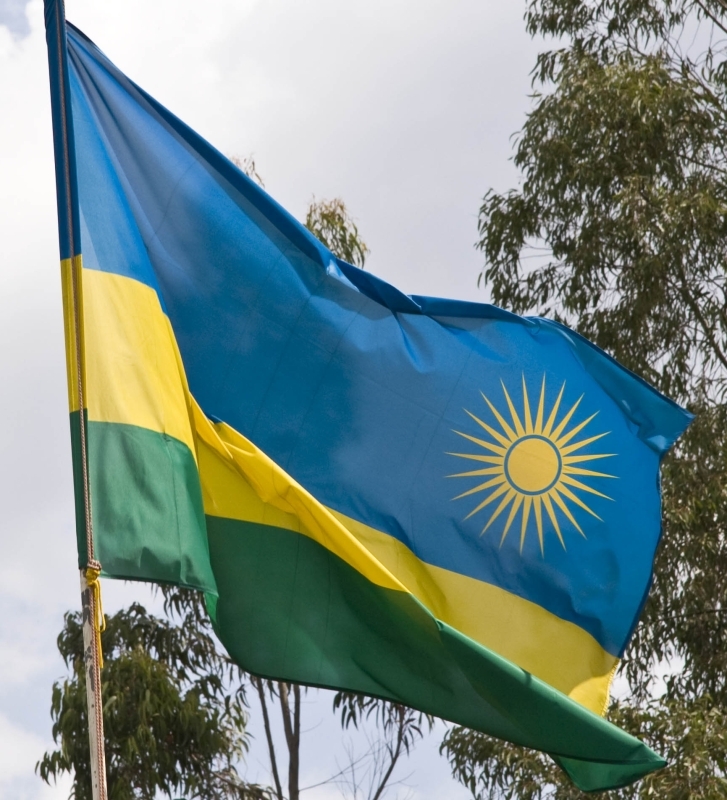 Take a lesson from Tanzania, the Congo(s) and Namibia - a nice bend sinister (diagonal to upper right) will remove all doubt as to what continent your flag is from. 3. Russia. 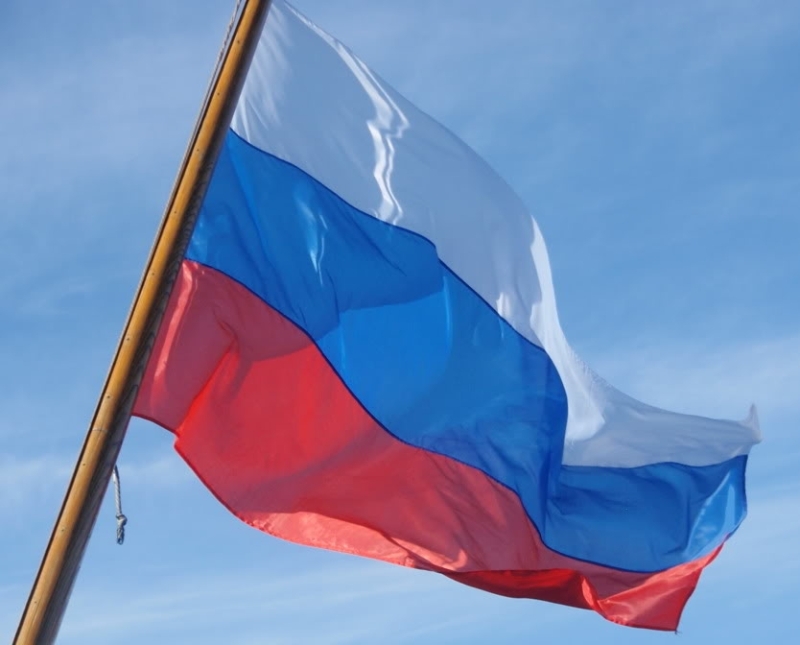 Obviously there's the pan-slavic confusion issue, but that's not on Russia, who was using these colors in 1668. It's a serviceable flag, though I am sick to death of Red-White-Blue (thank you, Dutch! ), so it leaves me less than inspired. Nice lighter blue, though. B+, I guess. I would like to amend my Qatar rating. It should be an A. The only reason it's not A+ is because of the over-long proportions. Also, it's my 3-yr-old son's favorite flag.